Life is hard and scary these days, but up until now the one thing we’ve always been able to count on is the comfort provided by those hideous foam/rubber/plastic Crocs shoes. That’s why it was so terrifying for an already-exhausted world to learn that the Crocs company would be closing its last remaining manufacturing facilities in Mexico and Italy. We already have Donald Trump and global warming to worry about, but now we also have to worry about where we’re going to get shoes that look awful, feel great, and come in a variety of colors? Humanity might as well give up now, because there’s no point in living in a world like that. Luckily, there’s no Croc-pocalypse to worry about. As reported by Paper, Crocs aren’t going away and the company isn’t shutting down production completely. 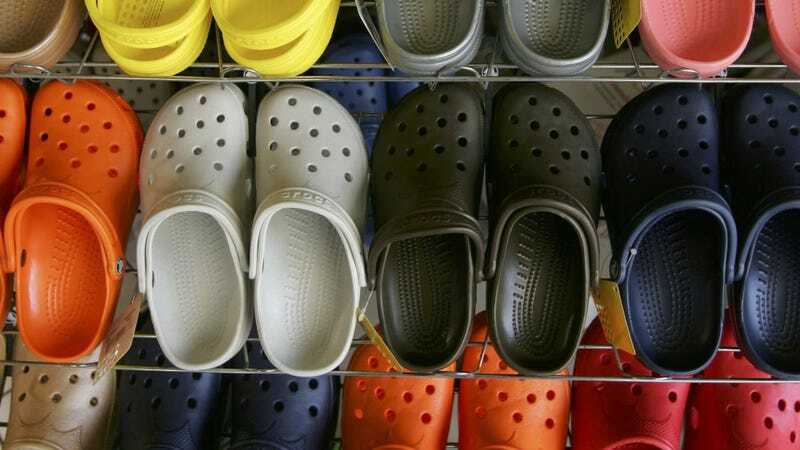 Instead, the shoes will be produced by third parties that can expand the company’s “manufacturing capacity.” In other words, Crocs are not only not going away, they’re going to become even more ubiquitous. Plus, it turns out that the leftover Croc material from punching out those little holes is going to be launched into space to create a shield that will reverse global warming, and also every new pair of Crocs from now on will include a copy of the Donald Trump pee tape, so all of our problems are now solved.